A senior Chinese diplomat and an expert in international affairs, Li Zhaoxing is currently a member of the standing committee of the 11th National People’s Congress (NPC), the Chairman of the Foreign Affairs Committee of the NPC, a member of the 16th Central Committee of the Communist Party of China, Honorable President of the Chinese People’s Institute of Foreign Affairs, and President of China Association for International Friendly Contact. Li Zhaoxing graduated with honors from the prestigious Beijing University with a major in Western Languages and Literature. He later obtained his MA at Beijing Foreign Studies University, formerly known as Beijing Foreign Languages Institute, a cradle of Chinese diplomats. He began his diplomatic career in Africa in the 1970s, where he first served as staff member and attaché of the Chinese Embassy in Kenya. 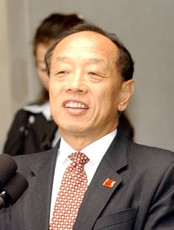 Positions he has served since then included staff member, Deputy Division Chief, Deputy Director General and Director General of the Department of Information of the Ministry of Foreign Affairs; Spokesperson of the Ministry of Foreign Affairs; Assistant to the Foreign Minister; Deputy Foreign Minister; China’s Permanent Representative and Ambassador Extraordinary and Plenipotentiary to the United Nations; and the Chinese Ambassador to the US. In 2003, he was sworn in as the ninth Foreign Minister of the country. Li Zhaoxing has made huge contributions to the expansion and the development of the country’s diplomatic affairs. His talents were manifested notably in his service as the Chinese Ambassador to the US. In face of the crisis evoked in 1999 as a result of the NATO bombing of the Chinese Embassy in Belgrade, Li endeavoured to keep US-China relations on track and move to steady improvement and development. On January 29th, 2001, the last day of his term in the position, the Mayor of Washington DC announced that day as “Li Zhaoxing’s Day” to recognize his contributions to the US-China relations. 4 years later, he received the Chilean Neruda Presidential Medal from Chilean Ambassador to China, on the 100th birthday of Pablo Neruda, a renowned Chilean poet and a Nobel Prize Winner.